When long meter life and light weight are needed in a totalizing water meter, Carlon’s JLP series meters are what you need. The JLP – NSF certified no lead line has a well deserved reputation for no lead and aggressive water applications. The JLP meter is available in 4 thread sizes – 1/2?, 3/4? 1? and 1 1/2? and operates at flow rates from 1/4GPM – 50 GPM, pressures up to 100 psi, and and temperature to 122° F. When you are managing more aggressive water, such as reverse osmosis or de-ionized water, you will want to choose Carlon’s JLP. 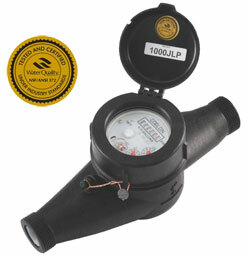 All of Carlon’s JLP meters meet or exceed AWWA specifications. Reward Points 193 points will be rewarded to you when you buy this item.